Red Candy Uk is a really fun website! 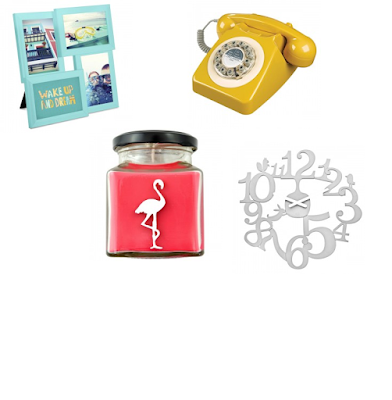 They stock some really amazing brands such as Flamingo Candles and Happy Jackson. They stock everything from telephones to candles to kitchen utensils! All of their products are so bright and colourful and look great! I love this vintage style telephone, it's just so quirky and fun, This mint photoframe would be a lovely addition to any room. Red Candy recently sent me this lovely Flamingo Candle to review, I already have a flamingo candle in a Parma Violet scent but they are just so good. I'm so happy to add another to my collection. This is Strawberry and Champagne scent, its so good! It smells like those strawberry and cream sweets with the swirl. I was also kindly sent some Happy Jackson lunch boxes which I haven't photographed yet but you can see them here on the Red Candy website, They are so handy and fun. They come in different sizes so they are perfect for whatever you decide for lunch!